What do you think, fellow Rockwall ISD property taxpayers? The State of Texas compares Rockwall ISD to nine similar size school districts. Outstanding debt per student in our district is $23,224. The average of the above ten school districts is $12,443/debt per student. 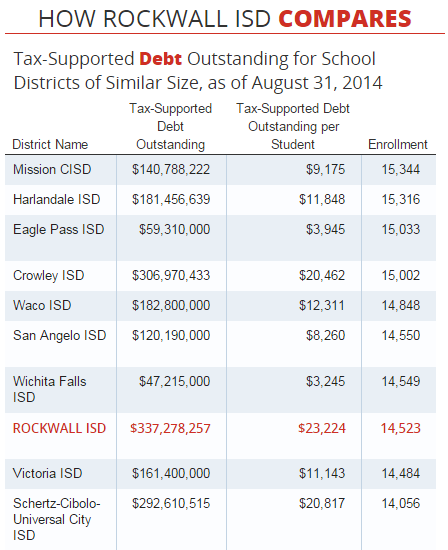 Rockwall tax-supported debt is nearly twice the average (1.9 times average). The above is from the closeout of 2014. If this 2015 bond election passes, Rockwall ISD tax-supported debt will skyrocket to $594 million [$337 million + 257 million = $594 million]. With respect to STAARS testing, the Texas Education Agency (TEA) ranks Rockwall ISD number 147 for 2015. Public debt is unsustainable. One blip in the economy and a wave of teacher layoffs follows. A trend I see in school public debt is this: the bigger the district, the greater the tax burden per pupil. Rockwall ISD administration boasts this 2015 bond election is the largest in all our history. Personally, debt is not something about which I boast. We may already be at a tipping point. Polls are open now for early voting through next week and then election day is November 3. I urge voters to vote Against (En Contra) the Rockwall ISD bond proposition. If using paper ballots as I do, this proposition is on the back side.